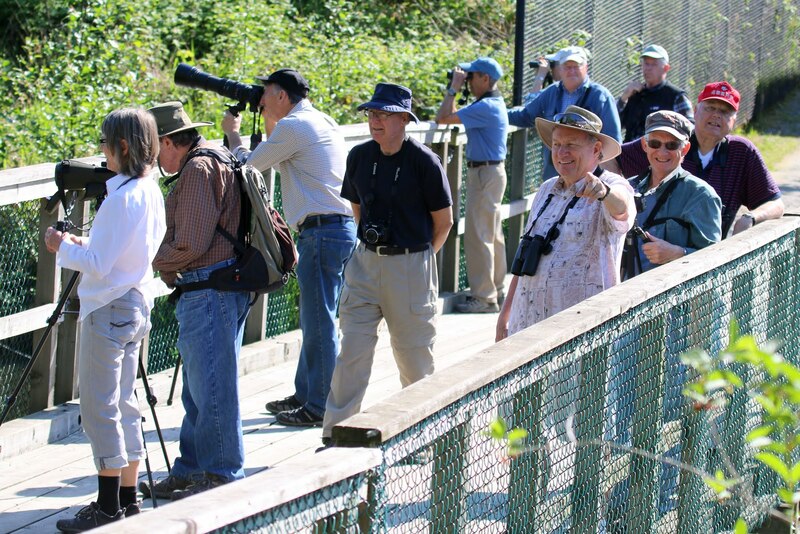 Twenty-six DNCBers (names at end) enjoyed a record hot (28 degrees) Wednesday morning of birding in three Parks in Ladner. Lots of neat sightings; check out photos by Brian BA), Liz(LS), Jim (JK), Terry (TC), Pat (PS) and more at our DNCB Picasa site. Nine of us car-pooled nicely from Petra’s in three vehicles at 7:30 a.m. driving straight through the Ladner farm roads and town to Ladner Harbour Park. 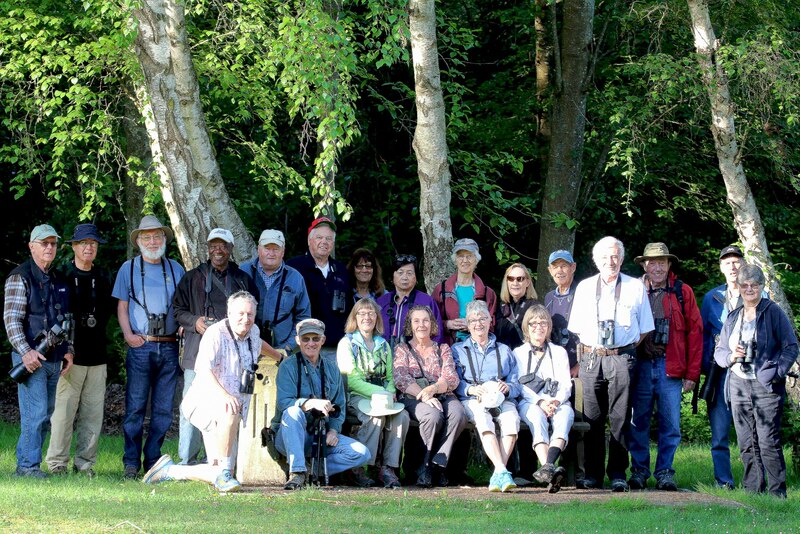 On arrival at 8:00 a.m., most of the rest were there trying to find calling Wilson’s and Orange-crowned Warblers in the trees around the parking lot. We joined them and found a singing Bewick’s Wren (one of many on the day) and a cavity-nesting Black-capped Chickadee. The construction to install the recently-arrived Heritage Home transported from North Delta to house the Park Manager raised a few enquiries as we started our march into the park. 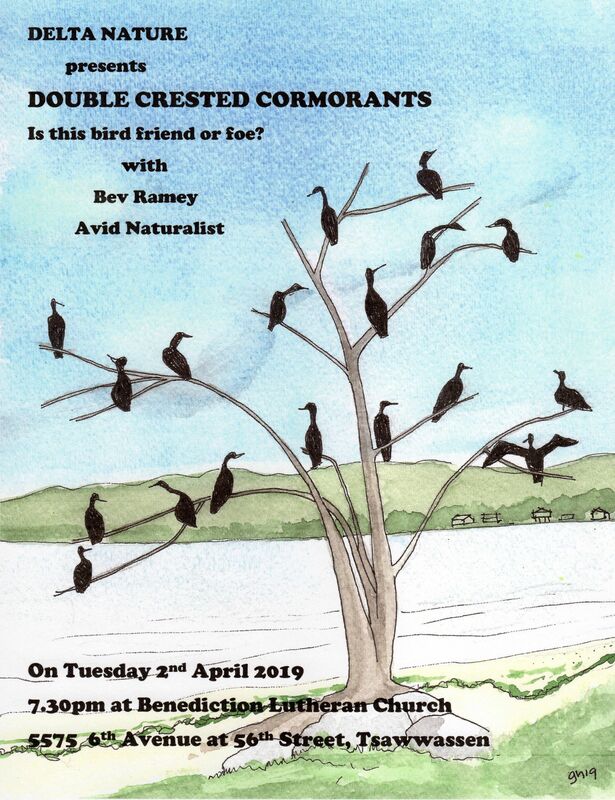 Some tried listening for birds/warblers in the trees, but as regularly occurs on our “casual“ outings, the focus on chatting and re-acquainting with friends takes precedence over bird searches. So, before the group broke off into chat groups, Terry took a Group Photo (22) as the brilliant warming sun shone down on us. Although there was nesting material at various spots under the roof of the Picnic Shelter, there was no evidence of successful wren nesting (see last year’s DNCB Outing 2015-13 report). An active Bushtit nest entertained us for a while as parents flew in and out. The trail was peaceful and cool as we ran into the occasional dog walker. We saw normal stuff like Northern Flickers and Downy Woodpeckers, Robins (but no Swainson’s or Varied Thrushes), House Finches and both Rufous and Anna’s Hummingbirds. We finally got a nice view of a Yellow-rumped Warbler (Audubon) near the marina. We walked off trail to the river where lots of Marsh Wrens were chattering. Pairs of Green-winged Teal and Mallards were lingering near shore. The cat tails were high so we only saw one Greater Yellowlegs fly up. Time-challenged Liz met us at the infamous non-Lookout and a friendly dog walker took another Group Photo with Liz and “Robinson” (dog’s name?) included in it. We saw a few Tree Swallows as Guru Mary T led us back to the parking lot through the Dog Pound. Lots of Bald Eagles (one Red-tailed Hawk) circling above and Great Blue Herons posing, even on branches over the slough. Kirsten tried in vain to turn a Song Sparrow into a Flycatcher. We “convoyed” from Ladner Harbour Park to Ferry Road and the park behind Chesapeake Condos next to the slough. I counted 16 vehicles in this convoy, almost all singles; not commendable car-pooling. In the slough were pairs of American Wigeon, Gadwall, Mallards and thankfully, beautiful Wood Ducks. Marion heard a Pacific-slope Flycatcher and we had Sparrow species (White-crowned, etc. ), but we couldn’t find our target White-throated Sparrow near Tree No. 112. Lots of commentary, mostly positive, about the tree and plant removal and re-planting of Cedars, Fir and other trees. Interestingly, several dead 15 foot trunks were cut near the base, we think to stop any re-growth on them, and to save them as useful sources of bugs for food and future cavity nests. Since Stormcat Paula volunteered to carry our $6000 Scope, we used it on the bridge over the slough to spot Wood Ducks, House Sparrows and a Racoon sleeping high in a tree. On return down the trail, Rob M got excited when a pair of Downy Woodpeckers briefly mated above us. Next stop, about 100 yards further down Ferry Road, was the South Arm Marshes Wildlife Management Area. Not much new stuff as we wandered down the peaceful main trail. We stared down an American Robin sitting on eggs in her nest right next to the trail. At the Lookout, Gerhard won the lottery as there was a bagful of beer cans for his Boy Scout collection. The view over the marsh back to Ladner and out over the Fraser (obviously the south arm) was brilliant. We left the lookout for the trail’s end and right next to the river. Here we finally saw our Shorebirds, up-close-and-personal. Long-billed Dowitchers (in reddish plumage) and both Greater and Lesser Yellowlegs were feeding in the mud. A flock of Dunlin, several with black bellies, were close by too. 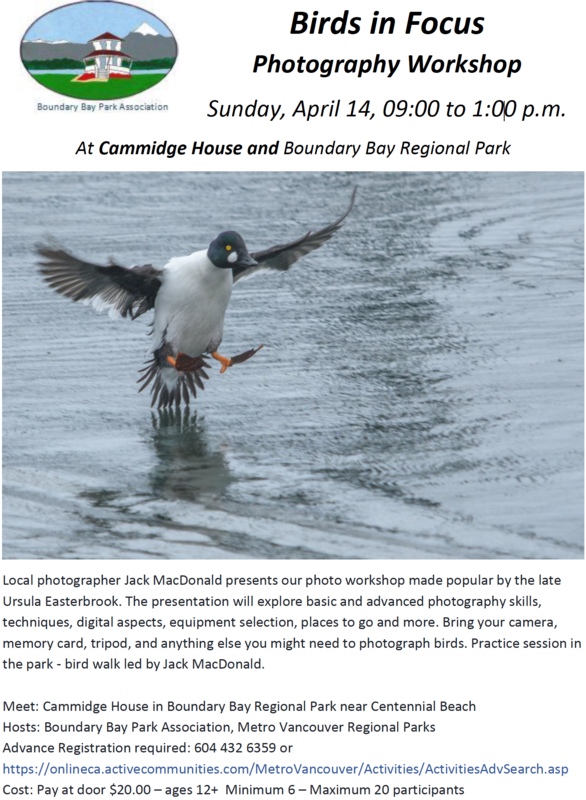 Also, a pair of stunning Common Mergansers and Green-winged Teal. 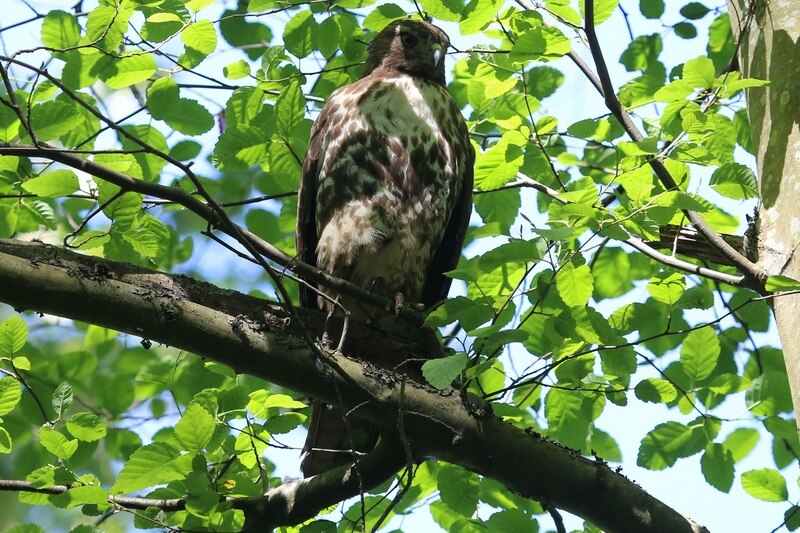 Wandering back to the entrance, Jonathan spotted a juvenile Red-tailed Hawk roosting just above us on the trail. We also saw another Robin staring back at us from her nest. Now 11:30 a.m. a dozen (Baker’s dozen as Paula joined us late) of us decided to have lunch at the Rusty Anchor Pub, at the marina down the road. Another good decision as my Steak sandwich and two pints of Canadian were scrumptious, and Julie & Claire really looked after us. 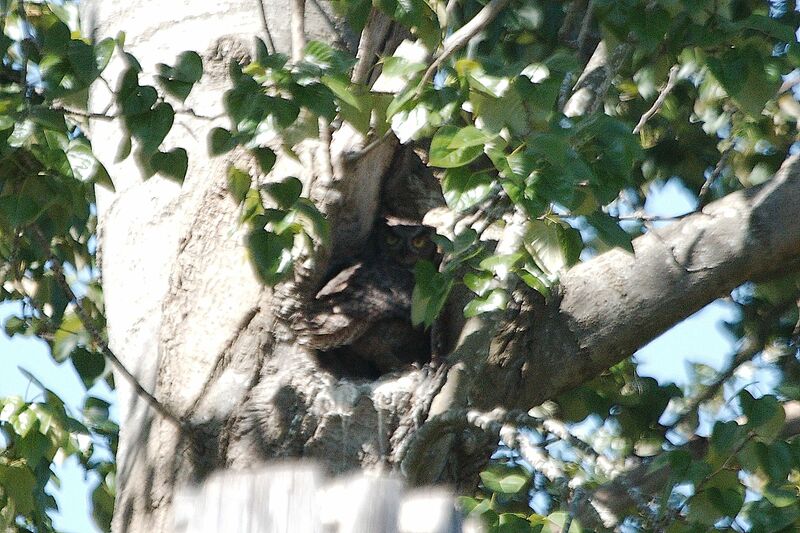 Following lunch, several came to my home at RiverWoods to check out the nesting Great-horned Owls. Bob & Claire welcomed us behind their home for good views of the two “fuzz balls” in the trunk cavity nest with Mom standing guard on a branch a meter away. We were rushed so I didn’t find Dad, but I know he was roosting in the trees nearby in full sight of his spouse and kids. 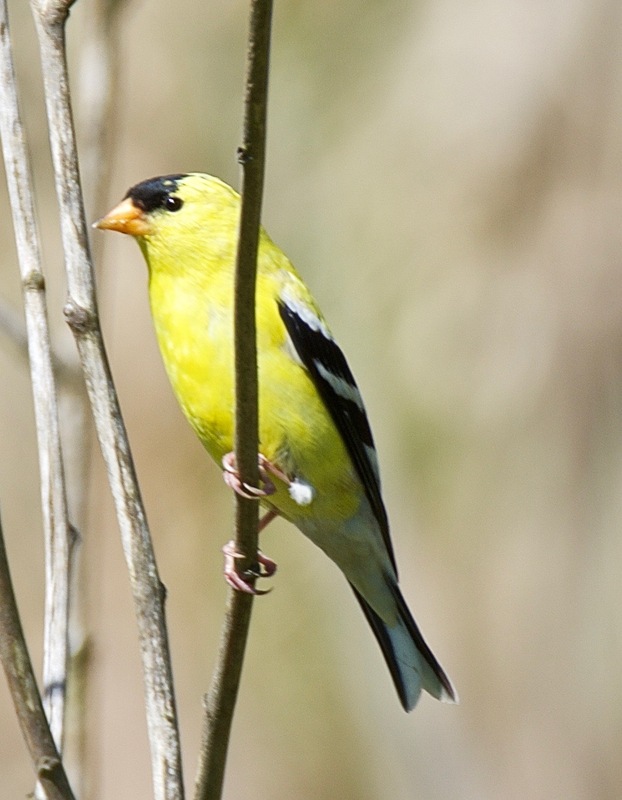 A vivid American Goldfinch and nesting Northern Flickers also entertained us here. We got back to Tsawwassen around 2:00 p.m., another super DNCB outing. 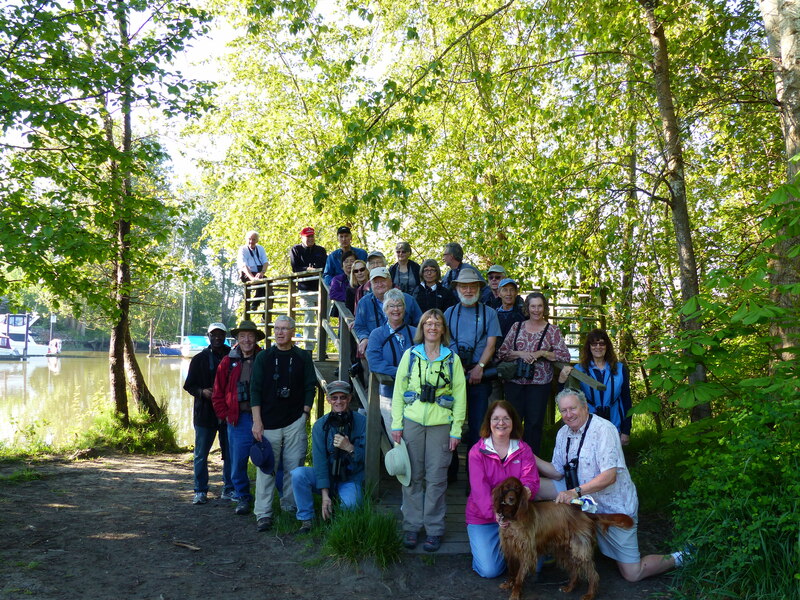 Next Wednesday, April 27, we’ll leave Petra’s at 7:30 a.m. for Brydon Lagoon and Hi-Knoll Park in Langley. We expect to meet others at the parking lot on 53 Ave., at bottom of 198A St. around 8:30 a.m. (or earlier, depending on whether Roger drives). Hopefully some Langley Nats will join us on this outing. The 26 were: Terry C, Liz S, Brian A, Rob & Marylile, Mike B, Jonathan & Lorraine, Marion S, Jim K, Johnny Mac, Jean G & Pauline O, sisters Pat & Maureen, Mary T, Roger Two K, Ray & Stormcat Paula, Sheila Y, David & Noreen, Kirsten, Gerhard, Richard H and me. 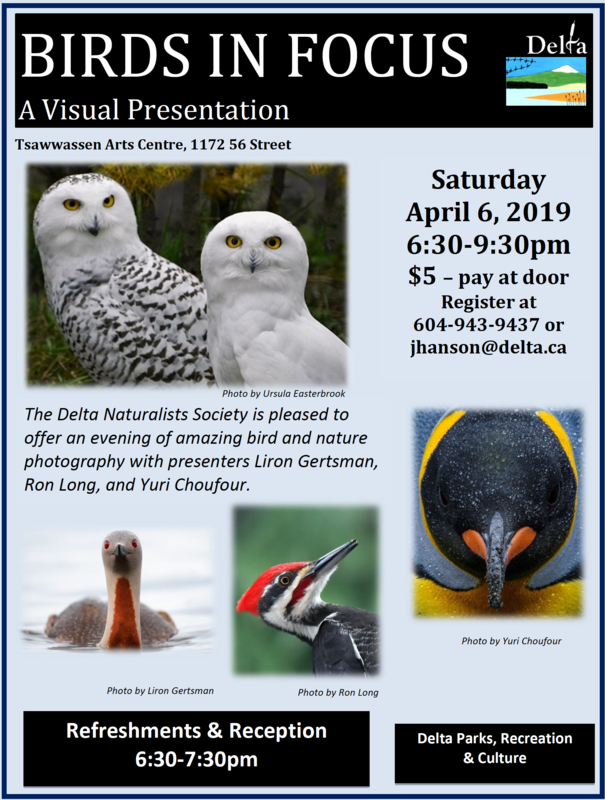 This entry was posted in *DNCB, Bald Eagle, Dunlin, Great Horned Owl, Ladner Harbour Park, Ladner S.Arm Marsh, Long-billed Dowitcher, Pacific-slope Flycatcher, Red-tailed Hawk, Yellow-rumped Warbler. Bookmark the permalink.